Whether you use your boat or other personal watercraft daily, weekly or just a few times a year, you want to ensure that it has maximum protection for the premium you are paying. As a broker, EINSURE offers this specialized insurance through a variety of insurance coverage providers. That means we do the shopping for you to keep your coverage protection high and your premiums affordable. We offer boat insurance coverage for the occasional captain or serious boatman, and on every level in between to ensure that not only you, but any passengers aboard your vessel are totally and completely protected while enjoying your boat. At your Las Vegas EINSURE office, we have plans to insure watercraft up to 50 feet in length and $250,000 in value (restrictions may apply), and wonderful options to fit your needs. Agreed Value – protects your watercraft investment without the worry of depreciation for total losses. Disappearing Deductibles – we lower your deductible by 25 percent for each claim-free renewal. Fishing Equipment Replacement Cost – up to $10,000 for damaged or stolen tackle, rods, and reels. Replacement Cost Personal Effects Coverage – protects your personal items while on board. 24-Hour Roadside Assistance – we’ll tow any car, truck, or boat trailer that becomes disabled while hauling your boat, even if the vehicle’s not insured with Progressive. Plus, there’s no annual limit on your number of tows! Medical Payments Coverage -including water sports, like tubing, wake-boarding and waterskiing. Make sure that your boat insurance is with a trusted insurance provider from EINSURE. 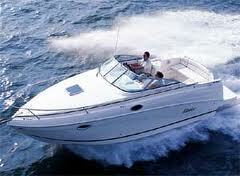 Receive your Free Quote for Boat Insurance Today.